An indicator developed by Gerald Appel that is calculated by subtracting the 26-period exponential moving average of a given security from its 12-period exponential moving average. By comparing moving averages, MACD displays trend following characteristics, and by plotting the difference of the moving averages as an oscillator, MACD displays momentum characteristics. See our ChartSchool article on MACD. A visual representation of the difference between the MACD line and the MACD signal line. The plot of this difference is presented as a histogram, making the centerline crossovers and divergences easily identifiable. 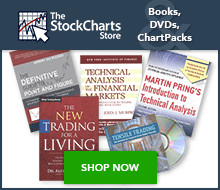 See our ChartSchool article on MACD histogram. Also known as market cap, it is the total market value of a company (number of shares outstanding multiplied by the price of the stock). A company with 1 million shares outstanding and a stock price of $10 would have a market capitalization of $10 million. An order to buy or sell a security at the prevailing market price. Sometimes referred to as “at the market,” these orders are usually filled immediately by the market maker. A sell order placed at the market will most likely be filled at the bid price and a buy order will be filled at the ask price. A breadth indicator derived from each day's net advances (the number of advancing issues less the number of declining issues). Similar to MACD, the McClellan Oscillator is a momentum indicator that is applied to the advance/decline statistics. As a momentum indicator, the McClellan Oscillator attempts to anticipate positive and negative changes in the AD statistics for market timing. Buy and sell signals are generated as well as overbought and oversold readings. Traders may also look for positive or negative divergences to time their trades. See our ChartSchool article on McClellan Oscillator. A cumulative sum of all daily McClellan Oscillator readings that provides longer-range analysis of market breadth. Often regarded as an excellent indicator of the overall “health” of the market and the market's current trend. It was developed by Sherman and Marian McClellan and first presented in their book Patterns for Profit. See our ChartSchool article on the McClellan Summation Index. A leading indicator measuring a security's rate-of-change. The ongoing plot forms an oscillator that moves above and below 100. Bullish and bearish interpretations are found by looking for divergences, centerline crossovers and extreme readings. A volume-weighted momentum indicator that measures the strength of money flowing in and out of a security. It compares “positive money flow” to “negative money flow” to create an indicator that can be compared to price in order to identify the strength or weakness of a trend. The MFI is measured on a 0 - 100 scale and is often calculated using a 14-day period. See our ChartSchool article on Money Flow Index (MFI). A three-day bullish reversal pattern consisting of three candlesticks - a long-bodied black candle extending the current downtrend, a short middle candle that gapped down on the open and a long-bodied white (hollow) candle that gapped up on the open and closed above the midpoint of the body of the first day. An average of data for a certain number of time periods. It “moves” because, for each calculation, we use the latest x number of time periods' data. By definition, a moving average lags the market. An exponentially smoothed moving average (EMA) gives greater weight to the more recent data, in an attempt to reduce the lag. See our ChartSchool article on Moving Averages. Multicollinearity is a statistical term for a problem that is common in technical analysis, that being when one unknowingly uses the same type of information more than once. One needs to be careful and not utilize technical indicators that reveal the same type of information. See our ChartSchool article on Multicollinearity.